GPS Your Best life…The What and the Why Make the HOW possible! “If you don’t know where you are going, how can you expect to get there?” This is a quote by Basil S. Walsh. Imagine going to a mega mall that you have never been to, one where you could get lost in the parking lot, let alone in the mall. Amy and Emma had were overwhelmed by the size of the mall, and how they would find their vehicle after a day of shopping. As they entered the mall they noticed the “you are here” sign. Taking note of the current location was the first step in finding their car at the end of the day and navigating through the mall. This sign helped them Get Positioned for Success (GPS). Knowing where you are right now… not yesterday and not tomorrow… but right now, is the first step. Take a few minutes to acknowledge your strengths, your values and what makes you who YOU are. Think about the quality of the relationships you are in (friendships, business collaborations, marriage or dating, family relationships, and your relationship with yourself). Consider the aspects of your life that are comfortable or better yet, going well. What about the areas where you feel off course? Knowing where you are is the first step in getting in the driver’s seat to create your best life. What do I love to do that feels effortless? What do people acknowledge my strengths to be? When I sit back and imagine my life as it could be, what does that look like? Sometimes people try to map their plan before they are CLEAR on the what and the why. Mapping your plan is the how. When you know what your life is like now, and what you envision for future, you can map out how to achieve that reality. Chunk it down, think about the actions in bite size pieces. Write down every possible action (don’t’ worry about the order of the steps) to make the goal a reality. Every day, choose five mini actions, we call this your Daily Five GPS steps. Little steps lead to consistent action and big results. And along the journey remember to acknowledge your growth and successes, and share them with others. 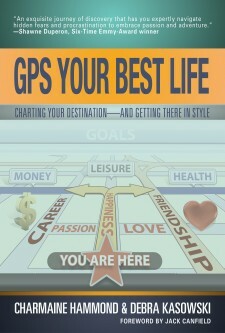 Comments Off on GPS Your Best life…The What and the Why Make the HOW possible!